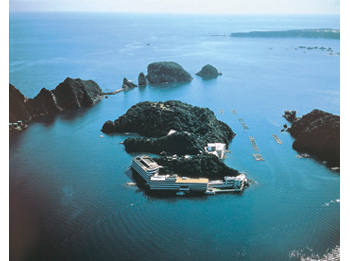 Hotel Nakanoshima is on the island and all rooms are facing to the ocean. It is the only hot spring hotel on the island in Japan. The whole island is the green botanical garden and enjoy strolling the promenade to the top of island where overlooking the Pacific Ocean. Please relax watching the view from the open-air bath whilst listening to the crashing waves. 7 minutes walk from JR Kii-Katsuura station to the pier, and 3 minutes by boat from the pier.